A Canadian study has found that mothers are more likely to continue to breastfeed for six months if they report higher satisfaction with the level of father involvement. This is more so when there are older siblings. The researchers recommend a coparenting approach to breastfeeding support, which addresses both breastfeeding and father involvement in the same process. They note that breastfeeding is rarely promoted in this way, including by leading international breastfeeding organisations. Other research shows that maternal efforts to increase father involvement are not very successful – it depends more on the father’s own view of gender roles. Interventions that put the onus on the mother to manage the father’s involvement, therefore, are not recommended. The researchers looked at data from 222 women drawn from a bigger 14 year longitudinal study in Canada, the Maternal Adversity and Neurodevelopment Study. The way that mothers rated father involvement also predicted later relationship quality as rated by the mother. This link between father involvement and relationship satisfaction backs up findings from earlier research. On average, mothers’ assessment of relationship quality falls after the birth, more so when there are older children. An explanation for this, well supported in earlier research, is unmet expectations around the sharing of domestic and childcare responsibilities after a baby is born particularly when there are older children and so more pressure. Breastfeeding is an activity that necessarily involves the mother more, so breastfeeding itself contribute to the role division that generates disappointment. The researchers found that earlier satisfaction with father involvement (at 6 months and 12 months) predicted relationship quality measured at 24 months, but not later satisfaction (at 18 months). Father involvement in the early period seems to be critical. Earlier research shows that the attitudes of fathers influence the ability of mothers to overcome feeding difficulties and the decision to continue to breastfeed. It is not just the explicit attitudes of fathers that are significant, but also more passive responses, for example, regarding the mother as the expert who does not need assistance or “interference”. 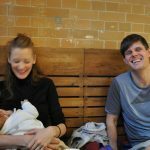 This lends additional weight to the proposal that fathers should be engaged in a coparenting approach to breastfeeding, where they learn how important and influential their role actually is. Photo: Krisztina Konczos. Creative Commons.